A great worry that can prevent teachers using clay in the classroom is the mess that it may make. Of course it is true that clay can be a messy activity which can upset the caretaker and the cleaners. Over the years working in schools and in particular in primaries ,where most activities take place in the classroom, I have acquired a few simple practices that minimize mess. Secondly- restrict the use of water to a minimum. It is something of a myth that lots of water has to be used with clay. It doesn’t. Many pupils and teachers are aware of the process of throwing clay on an electric wheel to make mugs and jugs. This process does require lots of water but hand building does not. If the clay is soft coming out of the bag it will stick to itself or a dab from the finger will do it. there is no need to make clay into mud. Put water in a flat paint dish so that it can not be knocked over. Table covers need to be heavy so that they do not slip or get dragged in different directions thus emptying the contents onto the floor. Covering the tables with newspaper serves little purpose and actually prevents pupils successfully rolling out coils of clay to construct their pots from. Working directly onto the table surface and using the edge of a plastic ruler to scrape off any excess clay before wiping is a better solution. I hope this helps and improves your experience of using clay in the classroom. Please get in touch if you have any other questions regarding this or any other aspects of working with clay and I will try to help. One of the biggest concerns teachers have about using clay in school is that they do not have a kiln to fire the work in. Although desirable it is no longer necessary. Like many teachers I have been disappointed in the alternative air drying clay that suppliers sell to schools and have refused to use it as it always seems to hard and dries really quickly, and frankly does not really have the same properties that we would expect from normal malleable clay. However, help is at hand and I would recommend Potclays Creative Grey. I have found it to be the best on the market. It has most of the qualities you would expect and when it does dry out a simple spray from a hand held water sprayer will restore the material back to good working health quickly. I would further recommend that schools purchase it directly from the manufacturer (Potclays Ltd) as I have discovered that it is difficult to know how long the material may have been on other suppliers’ shelves which can most certainly affect the condition of the clay. If you are ordering a large amount you can also save costs by arranging your own freight delivery. Once you have the clay, store it in a cool place wrapped in plastic or under a waterproof tarpaulin and it will last for months possibly years. If you have any other questions regarding clay in the classroom, do not hesitate to contact me. 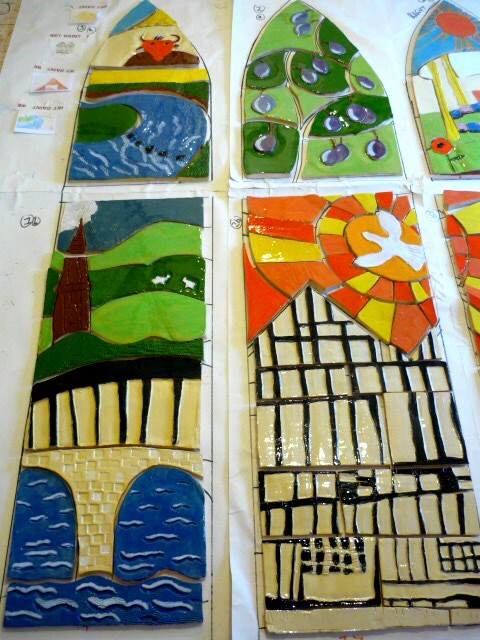 For more than ten years Richard Gibson, MA, of Claydayz has been organising clay workshops and mural and mosaic projects for schools and colleges. As all efficient companies do these days, Richard makes the time to elicit feedback from schools once he has completed a project. Interestingly, this feedback has thrown into focus some insights into what makes Claydayz workshops and projects stand out from the crowd. Teachers and lecturers are the same as the rest of us and they have certain concerns when it comes to putting their neck on the block and inviting someone into school and college to take responsibility for a major art project. They worry about details such as will everyone see this as a success; will the artist be as good as I think he is; will he be able to cope with a range of pupil abilities and, in some cases disabilities; will he complete the project on time; will he accommodate our timetable and will there be an unholy amount of mess? All of these concerns are perfectly valid and this is why Richard Gibson and Claydayz have been so successful over the years as these concerns are taken very seriously by Richard and are addressed as a priority on every project. Firstly, Richard has been an artist for over 20 years. He has a BA degree in sculpture and a MA in installation art. He is also a fully trained ceramicist who has exhibited widely. Since completing his education he has always made a living from art; no mean feat in any era. Richard has also spent many years as a lecturer in art so when he comes into schools and colleges he has the professional skills and knowledge of a real artist, and he can combine these with the necessary skills of a teacher. Having worked closely with the ’Artists in Schools’ Project he has advised teachers on how they can improve their creative classroom practice, so he is an experienced educationist. Richard has been commissioned to work with pupils in KS1 up to students studying at degree level. He has been commissioned to work with pupils with learning difficulties and those who have been identified as Gifted and Talented. He has also worked in referral units so is very competent when it comes to creating the right learning environment for those with behaviour challenges. Richard is in demand so completing projects to a timescale is as important to him as it is to the school. He will also fit in with the school’s preferred timetable. As far as mess is concerned he can work in a purpose-built area or he can adapt an ordinary classroom, making sure that when he leaves, so does the mess! Here are some comments from schools that Richard has worked with, in the last few days. `Richard’s passion for clay really enthused our students, they learnt many new skills and insights into the amazing world of clay! A very enjoyable and rewarding one day workshop.` Many thanks. I would just like to thank Richard from Claydayz for the outstanding tile mural he has produced with our SEN students, which now stands proudly on display on our entrance wall. 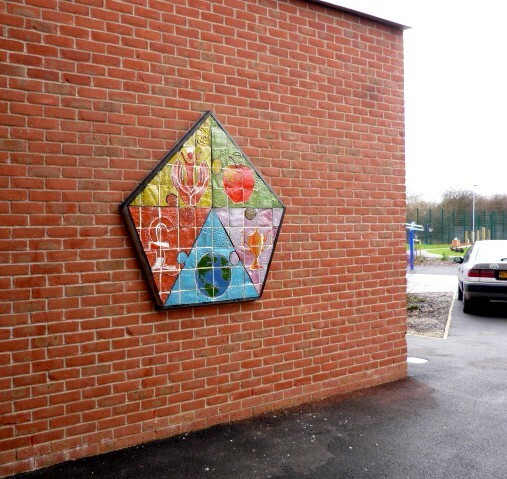 The project set was to produce a tile mural that reflected our SHAPE curriculum and that every student in the school could contribute to, and all this was achieved with a great deal of creativity and patience. Great relations with staff and school and kept to the time scales set. I have asked Richard to come back and do another project on Global Education with our students because I am so pleased with his first piece. Following the success of his clay workshops in schools and colleges, many teachers asked Richard Gibson if he would come back and take staff INSET, training teachers how to make the most of clay as a medium through which learning can take place. Richard created a workshop-style INSET and has for many years been going into schools to help teachers develop exciting and creative curricula that use clay. Many pupils, if not all, respond exceedingly positively to learning that involves them kinaesthetically. Teachers who have introduced Richard’s techniques into their lessons have, on many occasions, remarked that pupils who have behavioural difficulties become totally absorbed in the lesson when the use of clay has been at the centre of the learning. The keen interest that is aroused by using clay helps the individual pupil feel more fulfilled and this has a positive knock-on effect on behaviour generally. Richard Gibson’s INSET programmes cater for KS1 to KS4. Richard usually works closely with the teacher in charge of CPD before the training takes place so that the INSET training is individually tailored to the needs of the teachers. The topics that Richard has covered in these training sessions are wide and varied, helping make maths, English, science, geography and history come to life, as well as teaching clay making techniques, of course. Richard also explains firing, glazing, kilns and appropriate health and safety. Richard’s training sessions move at a brisk pace and are highly kinaesthetic which teachers usually find stimulating and fun. The time usually flies! It’s also a great way to team-build at the beginning of a new academic year or term. A typical INSET session will commence with a short introduction on the history of the use of clay and then move quickly into the specifics of what can be taught and how it can be taught. Teachers find this kind of training memorable because they work with the clay and experience the lesson from the pupil’s perspective. The following topics are ones that Richard has been asked to teach on numerous occasions and they have proved particularly popular and effective in the classroom. Pinch pots with eyes closed! Richard Gibson can come into school to do training at the beginning or end of term. He can also be booked to do twilight sessions. To book contact Claydayz on 07967215745. Call the studio on 01780 470447. Follow Claydayz on Twitter and see our Facebook page. 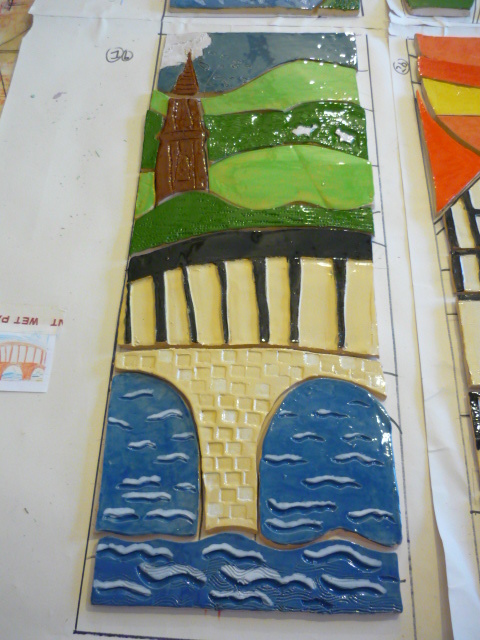 Claydayz also offers clay workshops for pupils, mosaic and mural projects and earth oven building.